The Main House is a three-story, Federal structure of painted brick that was built in 1815 by the brothers Thomas and John Thomson. In 1836, Cole married John Thomson’s niece, Maria Bartow, who was living in the Main House with her uncle along with her sisters. 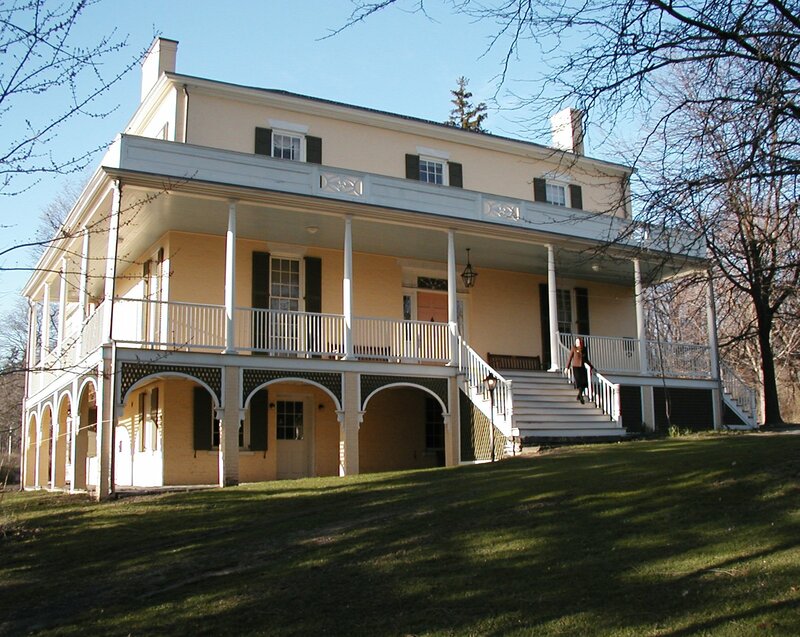 After Thomas and Maria were married, the Main House became Cole’s permanent home. During Cole’s lifetime the household included John Thomson, Maria’s three unmarried sisters, three of the Coles’ children, Theodore, Mary, and Emily, and several hired servants. In the 1830s and 40s, Thomsons, Bartows, Coles, and their servants occupied every inch of the main house, including its attic and basement, and space was tight. There were between 11 and 14 people living in the home during this time. Before the 1850s, American rooms seldom had fixed single uses as they do today. Like other significant rooms in the house, the entry hall had many purposes. In addition to providing a transition between outside and inside, the hall served as the receiving parlor for guests, a gathering place, a dining room, a children’s playroom, and a work area, especially in hot weather when the door could be left open to let in a breeze. Circular vents or grates in the second-floor bedrooms hint that a coal stove in the entry hall powered an innovative central heating system intended to heat bedrooms and the east parlor in the winter. The Thomson-Cole household used coal very early, as evidenced by records showing the purchase of coal stoves by John Thomson in the 1830s. The west parlor, or sitting room, always had opulent appointments right from the beginning when furnishings were first being acquired for the house in 1821. In addition to a pianoforte worth the great sum of $250, the room contained a set of rush-bottomed chairs with a settee—together worth $42—a tea table, a writing table, a valuable carpet, an elegant looking-glass valued at $45, and the latest heating technology, which was a pyramid stove that probably burned wood. Despite this stove, however, the family continued to complain of cold in their letters and diaries throughout the 1830s and 40s. Around the time of the Coles’ 1836 marriage, the room was modified and updated to reflect the new Greek Revival style then in vogue. The east parlor’s position and size make it the most likely location for family meals, although it was called the “East Parlor,” not the dining room. But in the first half of the nineteenth century, it would have been uncommon to have a designated eating room. Lightweight, highly mobile dining furniture moved around as required; and families used the room in which they ate for many other activities, including family prayers, children’s lessons, sewing, and socializing with friends. Thus, eating in the “East Parlor” rather than in the “dining room” followed period custom. Upstairs, the Cole sitting room, the children’s bedroom, and Thomas and Maria’s bedroom constituted the Cole family apartment. The sitting room particularly provided the Coles with a private space, separate from the extended family, in which to create and maintain a married life together. Over the years, as the Cole family grew, there is a sense that the room was a refuge for the artist as well as for his wife. In the winter, the Coles drew together around their stove for such activities as reading aloud, sewing, and making quilts. The small space off the Cole sitting room is believed to be the children’s bedroom. By 1846, Theodore, Mary, and Emily were old enough to share a room, which was common practice at the time. In an era of limited space, heat, and privacy, adults as well as children frequently shared bedrooms and beds. In fact, all three children may have slept in the same bed, or one child may have occupied a cot in the same room. In the north corner of the crowded house, Thomas and Maria enjoyed the luxury of a small private bedroom. This room’s proximity to the Cole’s sitting room and to the children’s bedroom had obvious advantages. The Cole’s bedroom also offered ready access to the stairway and, via a triple-hung window, to the second floor porch. Perhaps befitting their new status as a married couple, the Coles slept in the most expensive bed in the house, one of two curtained beds owned by John Thomson. The remaining bedroom on the second floor was occupied by Maria Cole’s three unmarried sisters: Emily, Harriet and Francis. Immediately after his marriage to Maria in 1836, Thomas Cole apparently worked in the main house itself. But in 1839, Cole was able to move to a larger and more private space in the Old Studio.